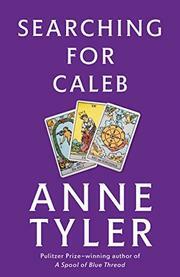 Anne Tyler returns to the "auras" of old families which she first explored in her novels of the mid-60's. Like the one in The Clock Winder (1972) the Peck clan of Baltimore is "closed around nothing"--bland, uniform, Peck-proud, decorously middle class. There will crop up, now and then, a few who might slip the leash, who want to "get to the bottom of things." Like Duncan who inexplicably marries first cousin Justine, now middle-aged, "lanky, weedy" and a gifted reader of Tarot cards. Justine accompanies her grandfather, Daniel, in his search for that arch maverick, brother Caleb, who simply walked out in 1912--shortly after posing for a photograph: "in tones of brown, framed in gold. . . playing a violincello while seated in an open stable door twenty feet off the ground." While Justine examines familial connections as carefully as her cards, and Duncan restlessly moves from job to job, place to place, Caleb is found after Daniel's death. Perhaps Caleb's lifelong independent adventure was only a flight, or perhaps a pilgrimage. As Duncan points out, he was "either very dumb or very smart." At the close Justine and Duncan (their daughter, a true Peck, has dissolved into the family landscape) make the final break, taking off with a carnival. Anne Tyler, like her Justine, is skilled in reading signs--from rings of molasses and catsup on a kitchen shelf, to the ghostly substance of old snapshots which hide as much as they state. Miss Tyler is at her most flighty--also twenty feet off the ground--but she always evolves the hardest of insights from the gentlest of people.